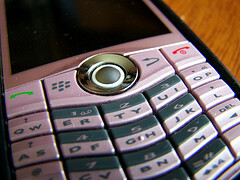 The latest mobile phone spam: no, the UK Government will NOT clear your debts! On Monday last week, my mobile phone rang and the caller’s number showed as 07893 300061. I answered my mobile and it was one of those ever-so-annoying recorded messages that click in when you pick up. Usually I hang up straight away and cuss a little, but I rarely get these on my mobile phone so this time I listened for a little while. Was I going to press ‘2’? Ha, not likely! I dismissed it as a likely scam, perhaps designed to allow whoever it was to bombard me with premium-rate text messages, and hung up. Let’s face it, the only scheme launched by the UK Government to write off 100% of people’s debts is called personal bankruptcy. On the Tuesday my phone rang again, twice, and it was the same recorded message. On the Wednesday my phone rang again, three times, and – you guessed it – it was the same recorded message. Goodness knows what spammy old database my mobile phone number has ended up on, but by this point the calls were really beginning to annoy me. I found the last comment particularly interesting. 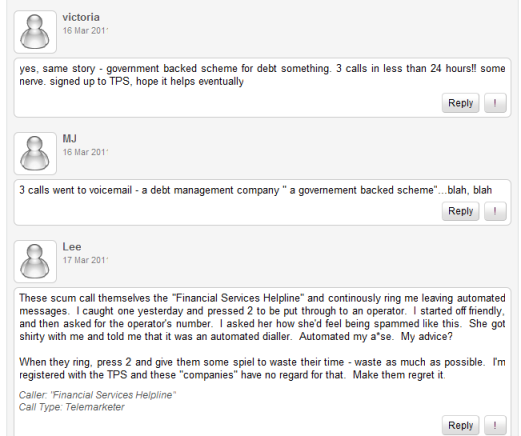 I can’t find any website for a UK organisation calling itself the Financial Services Helpline. However people on the WhoCallsMe thread report that even though they have signed up to the Telephone Preference Service, which makes it illegal for companies to make unsolicited marketing calls to their numbers, they are still getting these spam calls. Perhaps there is something in the water right now: Johnny Debt reports that spammers have also been sending out unsolicited text messages, claiming that the Government has introduced “Debt Settlement Orders”. If you are worried about debt, my advice is that you IGNORE these unsolicited messages and calls. I recommend that you call National Debtline on 0808 808 4000. This is a government-endorsed helpline that provides FREE, confidential advice on how to deal with debt problems. Many thanks for the mention Miss Thrifty. When It comes to debt issues, if sounds too good to be true – oh you know what I am going to say. It is very rare for debts to be written off!! If you are looking for a solution, get as much advice as possible. If you own a property, do not go into an IVA or bankrupt until you know definitely what the outcome will be. You may just end up loosing your home. Yep, I’ve had these calls too, I just ignore them. Hi Miss Thrifty, thanks for the info. Hello, Interesting, I also have received spam with the same approach but, as reported by Johny Debt, every time it was text messages. I thought spammers would prefer text messages as it allows them to tap into a “quick reaction” that people might possibly go for . And if the telephone number is actually a premium one, that’s where the money goes. As they are calling, I therefore assume the scam is even more sophisticated? Trying to bring people in and scam them. Very worrying indeed. Wow, you guys have to deal with those in the UK as well huh? I guess you can’t get away from them. I think we unfortunately drove many of them over your way with some recent legislation last year trying to put the breaks on many of these scam outfits out here in the U.S.A. They are desperately trying to figure out a way to continue to get in front of people. Whenever you call those numbers you are simply getting a sales person with basically no background or education in finance. They are there to sell you a program and not actually help you with your debt. Here is a great rule of thumb to go by when it comes to debt relief. If they are spending big money on ads, television, radio, all over the internet etc, trying to get you to call in for a free consultation, Don’t Call. They have to pay for all of those ads and you can bet your bottom dollar, the guy in the chair is trying to meet a sales quota and that is not the type of advice you are looking for.